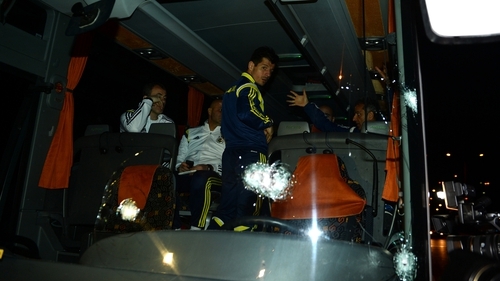 Gunshots were fired at a bus carrying Turkey's Fenerbahce football team back from their 5-1 victory over Black Sea side Rizespor, injuring the driver but leaving the players unhurt. Several shots were aimed at the bus as the Turkish Super Lig league leaders passed through the northeastern town of Trabzon yesterday following their away game in nearby Rize, said the club's vice president Mahmut Uslu. The driver managed to bring the bus to a stop despite being wounded in the face. He immediately taken to hospital in a police car, said Mr Uslu, who was on the bus at the time. He accused the attackers of trying to "crash the bus and kill the players". "It's unbelievable," he told Turkish television. None of the players were injured in the attack, which happened as they returned to Istanbul. Pictures of the bus showed a damaged windshield on the driver's side. 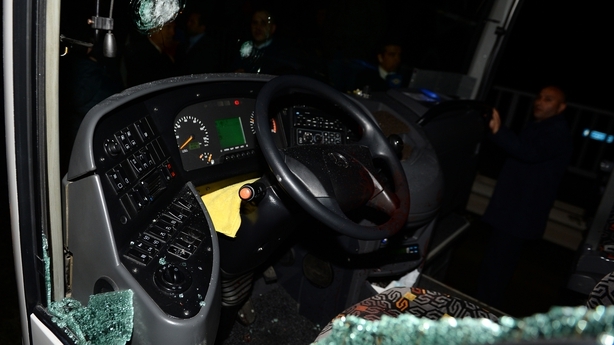 Trabzon governor Abdil Celil Oz confirmed the gun attack on the bus and said the driver's life was not in danger. "At first we thought stones had been thrown at the bus but police investigators at the scene have concluded it was an armed attack," he told the television station 360. The governor said he received a phone call from President Recep Tayyip Erdogan, a supporter of the Istanbul club, asking him about the investigation into the attack. The Turkish Football Federation (TFF) issued a statement condemning the incident "in the strongest possible terms" and called for the perpetrators to be brought to justice. The players and their entourage were later met by hundreds of supporters in the club's blue-and-yellow strip at Istanbul's Sabiha Gokcen airport, along with Fenerbahce's president Aziz Yildirim, images broadcast on Turkish news channels showed. Sports minister Cagatay Kilic described the attack as "cowardly and barbaric" but said the championship would go ahead as planned, as Turkish media responded with shock to the unprecedented attack on the club. It comes at a moment of high tension in Turkey after a week of political violence ahead of June elections. On Tuesday, two Revolutionary People's Liberation Party-Front (DHKP-C) militants took a prosecutor hostage at an Istanbul courthouse and held him for hours before all three were killed in a shootout with the police. A day later police in Istanbul killed an armed woman linked to the DHKP-C after she tried to storm the police headquarters in the capital.